Israeli Official Issues Warning As Airstrikes Continue Israeli fighter jets pounded Hamas targets in Gaza for a sixth day Thursday, and Palestinian doctors say the death toll in the territory now tops 400. 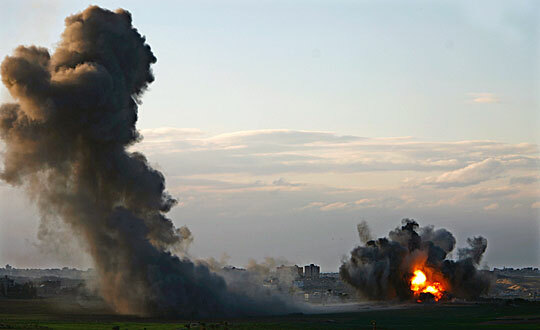 One airstrike killed a senior Hamas leader. 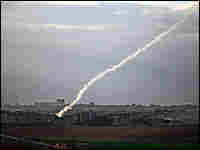 Meanwhile, rockets continued to hit southern Israel, and an Israeli official said the conflict is far from over. 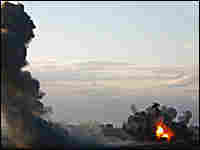 At top, a column of smoke and debris rises as the Israeli air force strikes Palestinian targets Thursday in the northern Gaza Strip. The second photo shows return rocket fire from the same area in northern Gaza, launched just seconds later to the north of Israel. 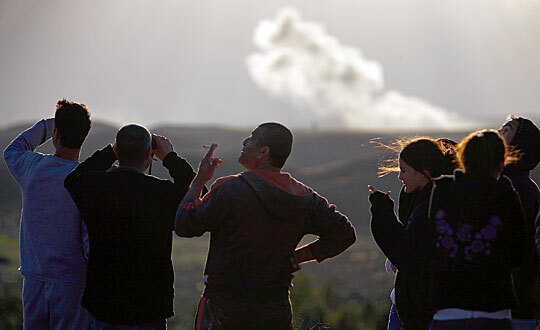 Residents of Sderot and visitors from nearby towns gather on a hilltop in southern Israel overlooking Gaza to catch a glimpse of Israeli warplanes dropping bombs in the distance Thursday. 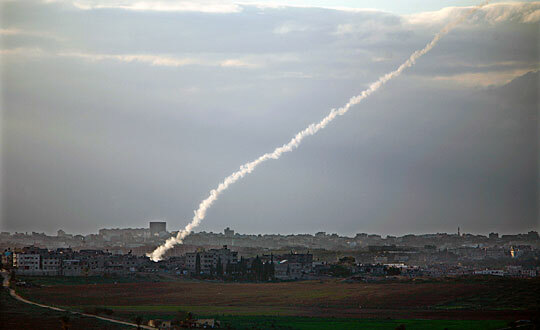 Sderot was also under fire from incoming Qassam rockets fired from Gaza during the day. Israeli fighter jets pounded Hamas targets in the Gaza Strip for a sixth day Thursday, and Palestinian doctors say the death toll in the territory now tops 400. One airstrike Thursday killed Nizar Rayan, the most senior Hamas leader to die since the Israeli offensive began Saturday. Meanwhile, rocket fire continued to rain down on towns in southern Israel, and a senior Israeli Cabinet minister warned that the conflict is far from over. Not long after word of Rayan's death, warning sirens sounded throughout Israeli communities within rocket range of Gaza: More barrages were on the way. In Ashkelon, people abandoned their cars in the street and fled for cover. Rockets also hit Ashdod and Beersheba again. Both cities are about 25 miles from Gaza. No one was seriously wounded in the latest rocket attacks. Inside Gaza, the fire from the air proved far more deadly. 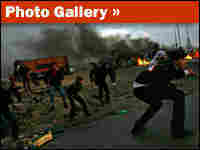 At least 17 Palestinians were killed Thursday, according to a senior medical official in Gaza, and 92 were wounded. Rayan was an important figure in Hamas' political and military wings. A professor of Islamic law and an imam, or Islamic preacher, Rayan openly advocated renewing suicide bomb attacks against Israel. He was in his house in north Gaza's Jabalia refugee camp when the bombs struck. The Israeli military said in a statement that the house was used as a weapons storage site and Hamas communications center. In addition to Rayan, the airstrike killed at least 11 others, including several of his children and two of his four wives. The airstrike also wounded civilians in the densely packed neighborhood. Rami Abu Safeya lives in the Jabalia refugee camp near Rayan's house. Reached by telephone, he said, "We laid down on the floor, glass and windows broke all around us. The explosions continued, and then 10 people in my house ran away. Many people in the neighborhood were injured." Back in Ashkelon on Thursday, Israeli Deputy Prime Minister Haim Ramon said the operation against Hamas is far from over. "This is not going to be an easy one. Therefore, we have to be very patient — very patient and very determined. And it will take time," Ramon said. Israeli leaders have said from the start that the goal of the punishing air and naval bombardments is to create "a new security reality" in the south and end Hamas rocket fire — not to overthrow the Islamist group or re-occupy Gaza. But on Thursday, Ramon argued that regime change in Gaza should be the wider goal of the operation. Ramon said ideally the moderate Palestinian Authority leadership led by Mahmoud Abbas — which now controls only the West Bank — should be returned to power in Gaza. "Even to create a Palestinian state is impossible because the Hamas is dominating Gaza. It's impossible. And if the Hamas will continue to dominate Gaza, it will be impossible to continue the Annapolis process. Any peace process will be almost be impossible to reach. 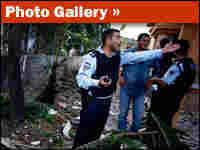 And that's exactly what the Hamas wants," Ramon said. But hardly anyone believes Israel can realistically uproot Hamas's deep support among Gaza's 1.5 million residents and impose a new, more moderate Palestinian leadership in the territory. Indeed, a senior Israeli official said later that Ramon was expressing his personal opinion and not government policy. The official said "regime change is not the operation's goal. We have no illusions about that. The goal is to bring about a new quiet in the south." That stated goal could give Hamas leverage in any cease-fire talks. Hamas leaders have said they want an end to Israel's stifling economic blockade of Gaza in exchange for a new, informal truce. The conflicting visions among Israeli leaders of what Gaza might look like when the shooting stops is reminiscent of the 2006 Lebanon war. Then, Israeli officials seemed frequently at odds over the goals and day-after scenarios of a conflict that many Israelis say marked a profound failure of leadership.